The Greater Kruger is an unfenced wilderness in South Africa , stretching over 400km from north to south. It combines private reserves and the national park and is known for high densities of lion, leopard and elephant. There are many ways to explore this wonderful and very accessible region which is at its peak between May and October during the long cool winter months. A safari in Kruger lends itself perfectly to being incorporated into a longer holiday in Southern Africa. Here, we review our recent stay at MalaMala as well as giving general information about the Kruger and how to combine it in your holiday. Three distinct camps (Main Camp, Sable Camp, Rattray’s Camp) stretch out along the Sand River in the vast MalaMala Private Game Reserve. The reserve is sandwiched between the famous Sabi Sands region of Greater Kruger and Kruger National Park itself -it is the largest private Big Five game reserve in South Africa, comprising 13 300 ha (33 000 acres). The borders are unfenced allowing wildlife to migrate unhindered. The size of the reserve ensures guests enjoy an exclusive safari experience – you’ll see other MalaMala vehicles and anti-poaching teams going about their work but very little other traffic. 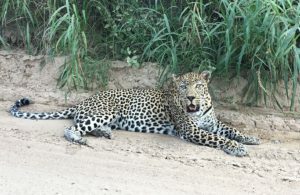 This area is known to be one of the best in Africa for seeing leopard. Guests have a good chance of seeing the MalaMala Big Seven (Lion, Leopard, Cheetah, Elephant, Buffalo, Rhino, Wild Dog). The setting is very beautiful with the Sand River in front of camp. The reserve has lots of contrasting scenery with dramatic granite kopjes (punctuated with klipspringer), mud holes perfect for white rhino and buffalo wallowing, the river for crocodile, hippo and elephant, open plains, forest, huge sausage trees and statuesque euphorbia candelabrum. The camp can be accessed via fly-in from Johannesburg (and Cape Town), either fly and transfer via Skukuza (about an hour’s drive away) or Nelspruit KMIA (2 hour road transfer) or a private charter to the airstrip moments from camp. 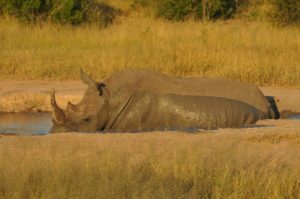 We hired an SUV in Johannesburg and stopped off in Hazyview for a night (staying at Rissington Inn – an easy 4 hour drive mostly on the N12, from OR Tambo) which then made MalaMala a simple 2 hour drive the following morning. The first hour or so is on tarred road, we then registered at Shaws Gate, paying our park fees, to enter the reserve area. There is an undulating dirt track which is well sign -posted with plenty of passing places. 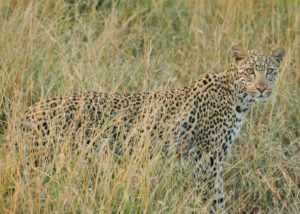 We came across this beautiful male leopard within moments of starting our 20km journey to MalaMala. We also saw elephant and white rhino along with many antelope and zebra. 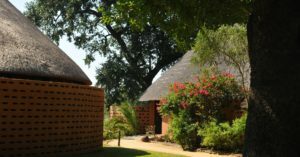 We stayed at Main Camp, the largest of the three camps, which consists of 19 luxury air-conditioned thatched rooms and suites. The lodge has been on this spot since the 1930s, originally a hunting lodge and converting to conservation and photography in the 60s – the first to do so. 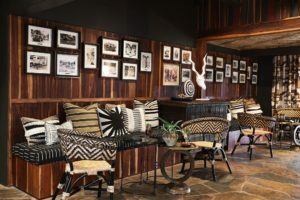 The camp was completely refurbished in 2018 and transformed from the old-school and old-fashioned hunting lodge style, to a beautiful far more contemporary property – the refurb has been sensitive with the historic exterior, boma, where Nelson Mandela has dined and various artworks all preserved. Travelling as a family we stayed in one of the Waterhole Suites. Other rooms/suites face the other direction towards the Sand River. The children had their own twin room and bathroom which led to a huge double bedroom, bathroom with bath and shower and wonderful outdoor shower. 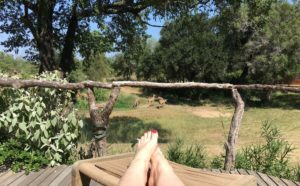 Along the front of the room and accessed from both bedrooms by sliding glass doors was a wooden deck looking over the waterhole where we had hippo, nyala, kudu and mongoose as visitors. 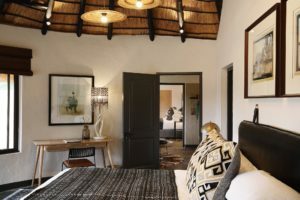 Rooms are extremely comfortable and stylish, retaining an African flavour with a natural colour palate, porqupine quill lamp and wildlife artworks. There are many thoughtful touches, for instance umbrellas in the hall, USB ports, extensive mini bar and fresh ice, a sweetie jar for the children. Closets had lighting, towels were fluffy and complimentary bath products smelt divine. Sable and Rattray’s camp are smaller and quieter. No children under 12 are permitted at Sable Camp and no children under 16 at Rattray’s Camp. MalaMala is open year-round. Visiting in April we knew it was the end of the rainy season and the bush would be very lush. As expected the weather was rather unpredictable. One day we had blue skies and temperatures of 38 degrees and the next it was 22 degrees cloudy and raining – we quite enjoyed the contrast – we still saw amazing wildlife, the landscape was beautiful, and even when we got soaked on the morning drive we knew we were returning to lovely hot showers, coffee and breakfast! 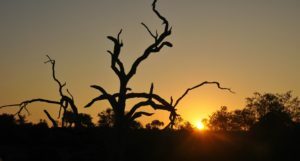 May to October (the cool dry winter) is considered the peak time for this area – the bush starts to dry out and die back, and weather is more consistent and reliable. Wildlife is easier to see as it gathers around the water sources and is not so easily concealed by the bush. If you are keen to combine a safari in Greater Kruger with a stay in Cape Town then April/May and September/October are the best months. The daily schedule changes with the seasons – for our stay we would be woken at 515am, for tea/coffee and a light snack on the deck at 545am with other guests, before departing at 6am. We would usually be back at camp for a hearty breakfast by about 9am. Breakfast and lunch are both in a buffet format and very high quality with a good choice. Where possible we dined alfresco on the deck. Breakfast included fresh fruit, juice, a hot buffet including pancakes or waffles and fresh breads. Lunch always included a lovely selection of salads plus cold meats, quiche and condiments as well as a hot option, for example, a curry. There was a choice of desert from fruit salad and ice-cream to lemon meringue. In the afternoon we would meet at 3-315pm (more bite size treats on offer plus tea/coffee and cold drinks) and leave at 345pm, returning to camp at around 7pm. On one evening we did stop for sundowners out on the reserve but wildlife viewing certainly takes priority here. Pre dinner drinks and nibbles would be in the bar at around 745pm with dinner following. We enjoyed gathering in the bar and completing the ‘sightings board’ each evening with all the guests and rangers – a very communal activity. Dinner is chosen from a set menu with Michael the barman suggesting suitable wine pairings from the delicious range of South African wines. 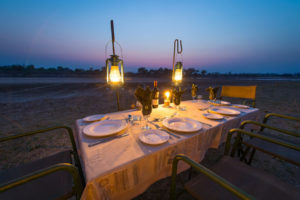 We enjoyed a candle-lit dinner on the deck on our first evening and joined fellow guests around the camp fire in the ancient boma, beneath the jackalberry tree on the following evening. Members of staff presented a cake and sang traditional songs around the fire to help one couple celebrate their Golden Wedding Anniversary. The staff added greatly to our experience from the efficient management team of Nerine, Alex and Vusi to the waiting staff such as smiling Stephalina with 22 years service. Everyone gets to know Michael-the-barman, who is a joy. Our guide was Thabisani from Richard’s Bay – he was a lovely chap, a skilful driver and very knowledgeable – we even learnt some Zulu and Shangaan in two days. We enjoyed talking to him about all manner of things from culture to wildlife. It is customary for rangers to join guests for breakfast and sometimes at other meals as well. The folder in the room dodges the question of tipping and leaves it very much at the discretion of guests which we can understand as it is a tricky one. 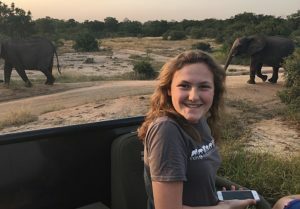 For many people, a safari holiday is the most expensive trip they will ever make but if you can tip then it is hugely appreciated by the staff. As a very general budget we usually work on $10-$30 US per person per day. You tip your guide/ranger directly with the ‘golden handshake’ at the end of the stay, and place your contribution for behind the scenes staff into the tip box (usually at reception). The vehicles are completely open allowing for unrivalled wildlife viewing. They have 3 rows of 2 seats meaning everyone had a great view. They are very comfortable and the camp has steps to help those with reduced mobility get in and out more easily. There is a central hatch between each pair of seats for putting your camera or binos. In here you’ll also find blankets and ponchos. There is also a place to put your water bottle (each guest is presented with a smart named metal water bottle on arrival and can refill this with still or sparkling water from the main deck water station as needed). Sabi Sands is known to be one of the best places to see leopard in Africa but we really did not expect to come across one within 5 minutes of driving through Shaw’s Gate! This was one of three leopard sightings during our short 2 night stay. We also had the joy of observing a pack of 8 Cape Hunting Dogs (wild dogs) as they socialised and warmed up on the tarred airstrip as the sun came up. I was not expecting to see cheetah with the bush so dense but we were treated to a fascinating face off on the last morning between an injured male and a hyena. 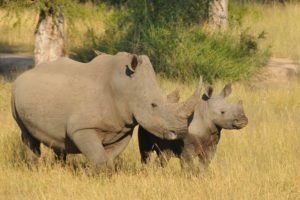 We enjoyed numerous and incredibly rewarding white rhino sightings, seeing several young with their mothers and being able to watch really interesting behaviour. 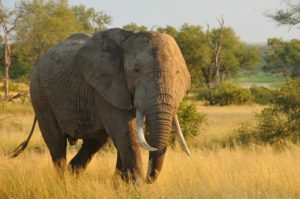 We saw elephant on the way to MalaMala and caught up with a lovely big bull on one of the afternoon drives but we had to work hard to see any others which is unusual for this area. We were rewarded for our patience in the end with one the most memorable elephant sightings I’ve ever had – a huge herd on the move surrounded our vehicle just before sundown – there must have been at least 80 elephants with lots of babies. It was incredibly special – you can see the short video clip on our social media feeds (Facebook; Instagram; Twitter). Antelope, zebra, giraffe, buffalo, hippo and many different bird species were all easy to see. We even saw a crocodile in the river. The most unusual sighting had to be the honey badger as it raced across the track right in front of us. Make no mistake, MalaMala is at the top end of the safari spectrum. Rates included all meals, drinks, game activities and WiFi. Hospitality, food and drink, guiding and accommodation were all exceptional, generous and wildlife sightings were rich and varied. 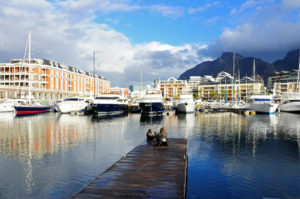 South Africa is an excellent holiday choice currently – the South African Rand is about 18 to the Pound (April 2019) so you can enjoy a diverse holiday combining a few days on safari with time on the Cape coast for example, for really good value, in comparison to other destinations. Staying in a private reserve permits off-roading and the chance to have very close wildlife encounters. You can also drive at night. If you are on safari in the national park you are limited to using the set road routes and you can only drive between sunrise and sunset. They each offer very different experiences. 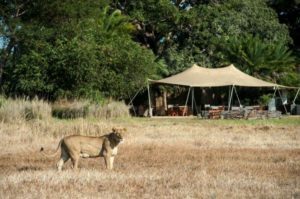 We offer many different camps and lodges in the Greater Kruger covering a range of price points, from small tented camps such as Garonga and Honeyguide to luxury lodges including MalaMala, Arathusa and Motswari. Please speak to us for advice. How long to safari? 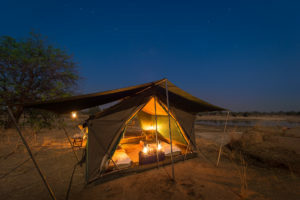 2 nights is really too short – we prefer a minimum stay of 3 nights in any one camp so you can really have a chance to see as much as possible (Kruger is a vast area so it also works well combining stays in different locations as we did). Stay in the Cape – fly from Johannesburg or KMIA Nelspruit to/from Cape Town. Kruger and the Cape are best combined April/May or September/October. 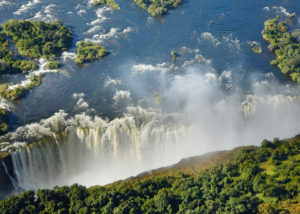 Visit Victoria Falls – you can fly on to Victoria Falls from Johannesburg or to Livingstone (the Zambian side of the Falls) from KMIA Nelspruit making for a fabulous cross border holiday. Escape to the beaches of Mozambique or Mauritius – there are many options here – you can travel by road from Southern Kruger across the border to Maputo in about 3 hours, for beaches in Southern Mozambique, or you can fly to Vilanculos for the Quirimbas. 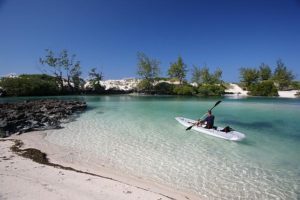 Alternatively you can overnight at Johannesburg airport and fly to the island of Mauritius. Go golfing – wish list golf courses are within reach of Kruger including Leopard Creek on the southern edge. Sun City is also easily combined with a safari to Kruger. Take the train – two of the world’s most luxurious trains operate in southern Africa out of Pretoria including the Blue Train and Rovos Rail. The Blue Train has a special Kruger itinerary as well as a 2 night journey to Cape Town. 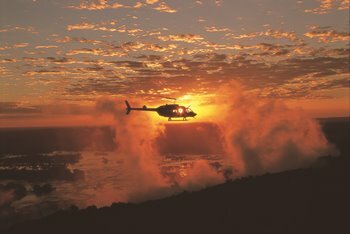 Rovos operates to Cape Town as well as a special golf and safari itinerary. Explore by car – self-drive the stunning Panorama route in Mpumalanga or connect south to Durban to explore the battlefields of KwaZulu Natal. The Drakensberg Mountains are another option. Looking for a malaria free safari option? South Africa has several malaria free Big Five reserves – speak to us about Madikwe or the Eastern Cape. To find out more about holidays to South Africa please visit the dedicated country page on the Real Africa website or call us for a chat on 01603 964 730. Zambia is an incredibly exciting destination offering the perfect blend of prime wilderness, outstanding wildlife and wonderful camps. An exciting network of large and remote national parks provide plenty of opportunity for an immersive safari experience, from the oldest, Kafue, to the newest, Lower Zambezi. This is a gem of a country where hospitality is warm, wildlife is awesome and scenery spectacular – we urge you to go. 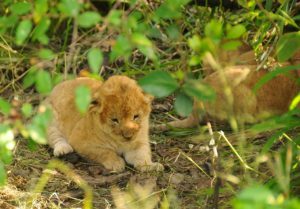 The long dry winter months April to October is the optimum time for a safari to Zambia. Days are warm and sunny and nights are cold. As the season progresses temperatures soar with October usually the hottest month. This is also when wildlife densities peak, as animals gather around the remaining water sources. Riverside camps offer a refreshing breeze and superb sightings. Camps/lodges with pools are a good choice if travelling in the heat of October/November. The long rains tend to arrive late November into December time and stay until March – this can make unsealed roads impassable. However permanent camps are open year-round – the Emerald Season can be a very rewarding time to travel. 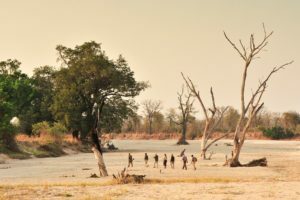 I speak from first-hand experience having spent a week in the Luangwa one November just as the rains arrived – it was astounding to see the overnight transformation of the park. Wildlife was exceptional. 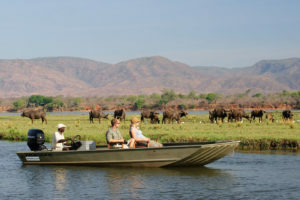 Some camps depending on water levels offer safari by boat giving you a unique perspective. 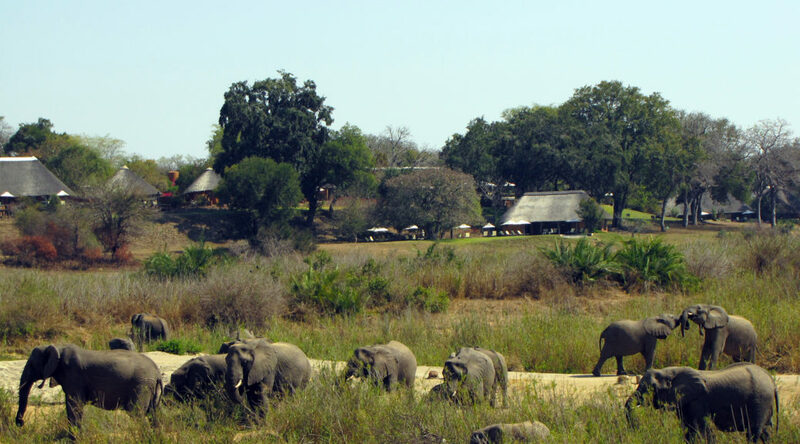 South Luangwa has been the home of the walking safari. since the 1960s. 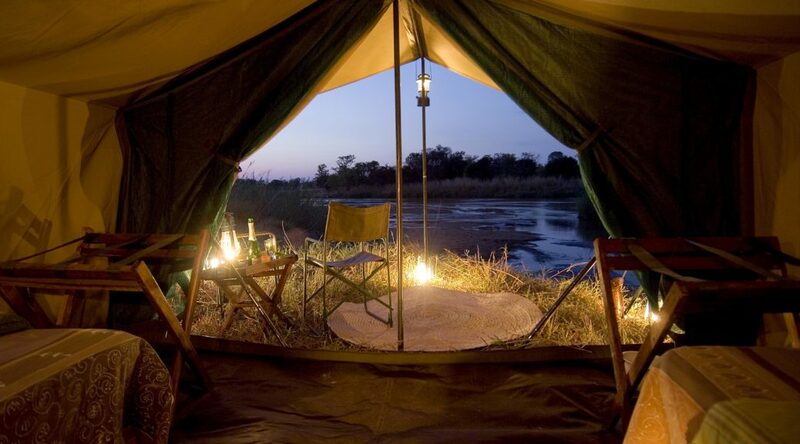 Guiding is consistently high quality and quality bush camps ensure a top notch experience. You can easily spend a week here. 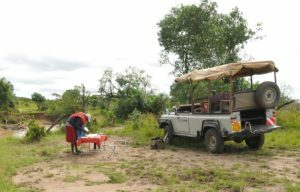 walking between bush camps, or combining a few days walking with a lodge and 4×4 safari. Walking can be tailored to your needs but 8-10km per day between camps is what you can expect. 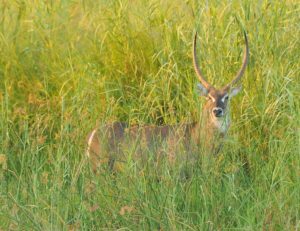 Although South Luangwa offers the largest variety of walking safaris, you can also enjoy walking in Kafue and the Lower Zambezi. 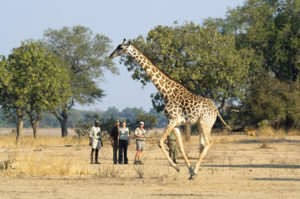 This 8 day safari combines contrasting camps and includes a walking element along with a 4×4 safari in the South Luangwa. 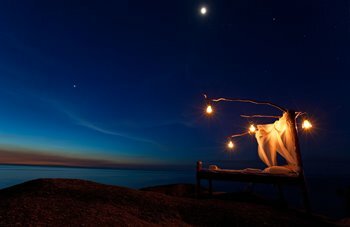 Zambia offers incredible rustic bush camps. These vary in style. During the peak dry season months of July to September you can spend a night or two of your safari in a mobile ‘fly camp’. These fully serviced mobile camps are extremely comfortable and well-equipped with walk-in tents and full bedding. The ‘safari’ bucket shower is under a tree and the long-drop ‘bush loo’ has a wooden throne. Meals of a high standard are served under the open sky with just the glow of the camp fire and paraffin lamps. 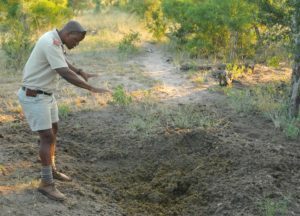 Mobile camps allow visitors to access really remote areas where the wildlife is unused to people. Zambia is also famous for its tented seasonal camps which open in April-May and are taken down at the end of the dry season in November.These camps, some with canvas and some with thatched roofs offer more facilities than the simpler mobile ‘fly camps’ but are still incredibly rustic and positioned in low vehicle/prime wildlife areas. Robin Pope’s Tena Tena for instance is a cluster of six tents on the Luangwa River. Ensuite bathrooms are open-air. Power is provided by solar panels and fresh drinking water comes from a bore-hole. Time & Tide’s wonderful Luwi is nestled in a grove of ancient mahogany trees, the tented suites designed to fully immerse guests into the bush experience. Set along the riverbed and overlooking the floodplains below, guests can watch the abundant wildlife right from the privacy of their own suite. Feathertop beds, an open air, ensuite bathroom and a peaceful seating area create a comfortable guest experience in this seasonal camp. If you are not a fan of spending nights under canvas, you can opt for a permanent lodge or safari house. These have more facilities and creature comforts. 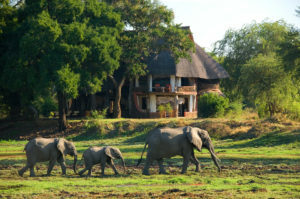 Zambia has superb ‘safari houses’ perfect for groups of friends or family groups. These houses are fully staffed with driver/guide and cook – choose from large, luxurious riverside Chongwe River House with its amazing pool, to small Robin’s House complete with its own hide . The Lower Zambezi is Zambia’s newest national park and sits bang opposite Mana Pools in Zimbabwe. If you like variety then this is the place to go – you can boat, walk, drive and fish, all with a beautiful mountain view and sublime wildlife. 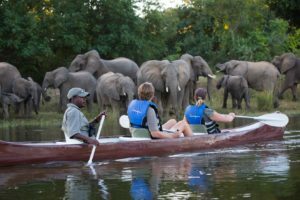 Canoe trips are exceptional allowing for very close encounters with large species like elephants who come to the river to refresh. You can glide along silently without disturbing the wildlife. As well as exploring by canoe, motorised boat trips provide the chance to explore larger tracts of the riverside. Combined with walking and 4×4 safaris this is a wonderful way to experience the richness and diversity of Zambia’s national park network. No trip to Zambia would be complete without a visit to the Falls. 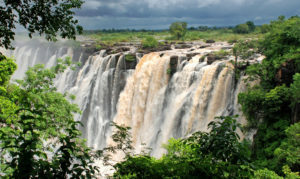 Livingstone is the town on the Zambian side of the Falls where many activities such as rafting can be organised. A number of stunning river lodges stretch along the river bank upstream from the Falls. 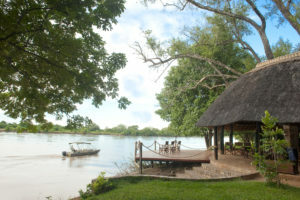 Lodges provide complimentary transfers for guests to the Falls with some also offering activities such as river cruises. These lodges are a wonderful choice for pre or post safari R&R. An increasing network of domestic light aircraft flights connects several of Zambia’s key attractions with the main gateways of Lusaka and Livingstone meaning you can combine parks such as the Lower Zambezi and Mfuwe in the South Luangwa more easily than ever before. 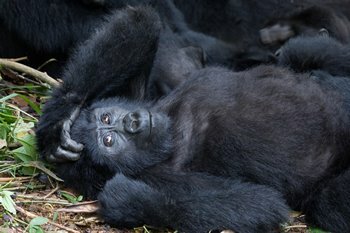 Visitors to Zambia can enjoy spectacular wildlife including the chance to see many rare and iconic species. 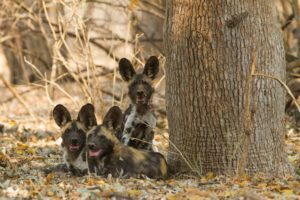 The Zambian Carnivore Programme recently announced that the South Luangwa National Park is now officially home to Zambia’s largest African wild dog population. Despite being one of Africa’s most endangered carnivores, wild dogs in and around the South Luangwa National Park have enjoyed several years of increasing numbers, and there are now estimated to be approximately 350 adults and yearlings living in the Luangwa Valley. 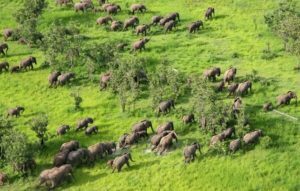 To find out more about Zambia’s national parks, you may be interested to read our country guide here. 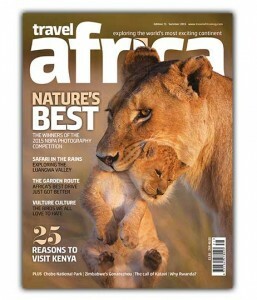 You’ll also find sample safaris, with price guides. There are so many safari options, it can be tricky working out what’s best for you. Here we look at the joy of private conservancies and how they differ from a national park/reserve experience. 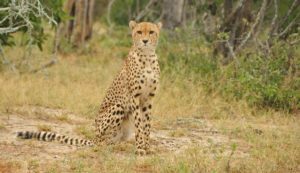 Private Conservancies vs National Park Private conservancies are privately owned and run conservancies or reserves which tend to be located just outside the main national park or reserve. To maintain migration corridors national parks (like Kruger in South Africa or the Masai Mara in Kenya) are unfenced wilderness areas allowing for the free movement of wildlife. National parks are managed by local councils and government bodies who are responsible for monitoring wildlife, anti-poaching, security and maintaining roads and facilities. Lodges are usually quite large to accommodate demand and visitor numbers are not usually limited. In peak seasons there can be a high density of vehicles. There are strict rules in the national parks – drivers must keep to designated trails and safaris can only be enjoyed between sunrise and sunset. Private conservancies in contrast, work in partnership with the local community landowners. Because they are owned and managed privately, visitor numbers are strictly controlled. In Mara North in the Masai Mara for instance there is one guest on average to every 350 acres. Camps and lodges tend to be small so guests see very few other vehicles compared to the national park. Environment Private conservancies protect important ecosystems, for example the Greater Mara Eco-System in Kenya and the Okavango in Botswana. They help to stop the degradation of these eco-systems, conserving wildlife and bio-diversity and allowing the habitat to recover. Community Local people are able to earn an income from eco tourism and wildlife conservation. In Kenya, Maasai landowners are able to benefit directly from working in partnership with camps and lodges, being paid a ‘bed night’ fee for every guest staying. In South Africa’s Greater Kruger the conservancies operate in the same way – collaborating with the local communities. 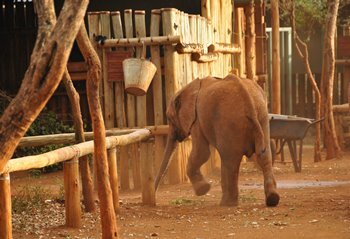 Eco-tourism Private conservancies champion low density responsible travel. In a nutshell this is the best way to safari without the crowds. 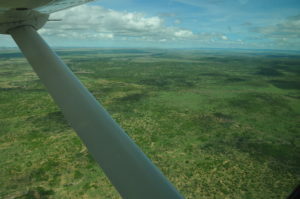 Private conservancies are often accessed by light aircraft flight, served by their own airstrip. Flying-in helps to maximise your holiday time and gives you a wonderful bird’s eye view in the process. Guests can enjoy a wide range of activities. These include 4×4 safari, night drives, walking, bush dining and sundowners on the plains. You don’t have to be back in camp by sundown so you can enjoy the conservancy to the full – stopping for a gin and tonic at sunset or heading out on a night drive with flashlights after supper. Private conservancies offer a quality, low density experience. Instead of large lodges you can stay in small tented camps/lodges. You’ll see fewer vehicles and enjoy better quality game viewing. You can get closer to the action. It’s good safari etiquette for guides to stick to trails to prevent grass erosion, however in private conservancies should you come across something exciting, like these gorgeous lion cubs, you can go off road to observe more closely – something you are prohibited to do in a national park. You can safari in the knowledge that your stay will be benefiting the local community and contributing to wildlife conservation. The Mara North Conservancy offers 64,000 acres of prime wilderness situated immediately to the north-east of the Maasai Mara National Reserve, and works in partnership with local Maasai landowners. In MNC, there are eleven member camps. Each is represented by a land management committee. The committee meets monthly with the Maasai Landowners Committee representing over 800 Maasai landowners, who have opted to lease their land for conservation. The MNC is one of the largest community and private sector owned conservancies in the world and this is the first time many Maasai have been able to receive a direct income from wildlife. Crucially, all the camps in the private conservancies promote low density tourism. 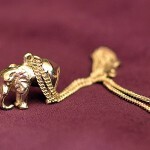 This ensures an exclusive safari experience and minimal impact to the environment and its wildlife. This is the same across Eastern and Southern Africa. Take your pick from Olare Motorogi and Mara North to name just two of many fantastic conservancies in the Masai Mara, Chyulu Hills on the edge of Tsavo and Amboseli or undiscovered Kalama or Sera north of Samburu. Kenya has many wonderful conservancies to choose from. Tanzania also offers wonderful private conservancies including five star Singita. 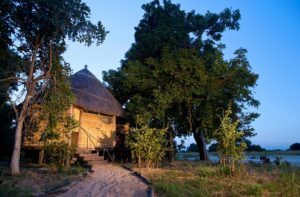 Further south you can enjoy legendary Selinda or Linyanti in Botswana’s Okavango among many other excellent choices, Linkwasha in Zimbabwe’s Hwange, Ongava in Namibia, or Sabi Sands and Timbavati in South Africa’s Kruger. Private conservancies offer guests the chance to get off the beaten track, for example Tswalu Kalahari also in South Africa, or Namunyak in the Mathews Range of northern Kenya. Ever wondered what its like to do a balloon safari in Africa? 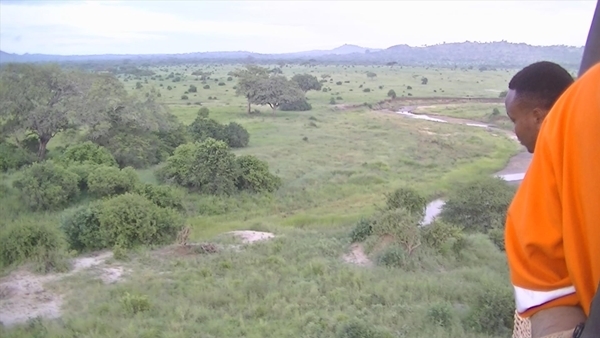 Robert was in Tanzania recently and went flying over Tarangire National Park. I was woken at 5.30am by one of the Masai guards knocking gently on my tent. 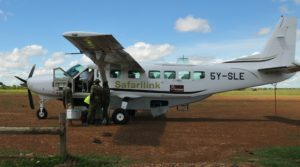 Fifteen minutes later, having been escorted by the same guard to the restaurant, I was standing on its terrace drinking fresh brewed coffee and taking to our pilot. Called Nihat, he had over 3,000 flight hours under his belt and spoke perfect English. Our land cruiser pulled up and we climbed in, leaving the camp as the first hint of dawn touched the eastern sky. It was a short drive, initially on a rough track before cutting off through the savannah to the launch site. The crew had arrived before us. The basket was in place, lying on its side with the burners and fuel all stowed and secured. The balloon was laid out flat on the grass and as we got out of our vehicle a large fan started blowing the first hot air into it. It rolled around, making it ripple like water in a bowl. Two crew pulled on a rope tied to the top of the balloon, keeping it taut. Once the balloon was semi-inflated the burners started blasting into it and within minutes it was trying to lift itself into the sky, the two men on the rope now joined by a third as they fought to keep it down. On a signal from Nihat they released the rope and the balloon swung into the air, gently pulling the basket upright as it fought to get away. It was not yet inflated enough to lift from the ground, even if the basket hadn’t been anchored to a land cruiser. We climbed into the basket. In a central section stood Nihat, surrounded in gas bottles and with the controlling ropes hanging in front of him. Either side the basket was dived into two sections, each with a low bench. Nihat gave a long burn, the heat strong on my head through the hat I was wearing. 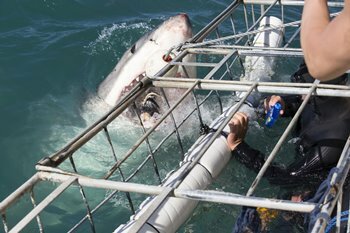 Slowly we rose off the ground and hung for a few moments on the anchor rope as final checks were done. When he was happy, Nihat released the rope and we rose into the African sky. It was surprising how quickly we left the ground behind. It was so gentle it felt as if nothing was moving and yet the World shrank in size and dropped away below us. When we got to 500 metres we levelled off, the whole of Africa seemingly stretching away in all directions. Lake Manyara was to the west, its white bed catching the gentle light of dawn. To its south was Lake Eyasi while to the north was Mt. Meru and Kilimanjaro. Tarangire was spread beneath us like an enormous pop-up map, the river that gives the Park its name meandering through its heart. We slowly descended as we approached the river, almost skimming the treetops as we dropped into its bed so that the steep-sided banks stood higher than we floated. Birds flew around us, their dawn chorus clearly audible and a herd of impala stood together watching as we passed, their tails twitching nervously. Nihat gave a long burn, the heat hot on my skin in the cool of morning, and after a few seconds the balloon responded and carried us over the approaching Baobabs and above an acacia forest. A family of elephants turned to face us, their trunks lifted as they tried to smell what was approaching. With one shrill trumpet, the matriarch told them to follow and she head off at a brisk pace into the undergrowth, her companions following in a line with the youngest in the middle. A couple of outlying members trumpeted in alarm, receiving an answering call to guide them in the right direction as we drifted overhead and away. My last sight of them was of them turning to face us once more, shaking their heads and returning to their grazing. A herd of buffalo, maybe 150 strong, didn’t flinch as we passed overhead, oblivious to their silent watchers. A silver-backed jackal, jogged past and a family of hyenas sat warming themselves in the early-morning sun. Giraffes stood watching with idle curiosity while different types of antelope grazed unperturbed. In a blink of the eye an hour had passed. Nihal had been looking for a landing spot, his spotters on the balloon radioing the back-up crew when a suitable place was spotted. We rose up, making use of that easterly breeze we’ed discovered earlier, before slowly drifting down to land in a spot I’d have thought it impossible to land in. When we were a few metres above the ground we all sat on the small benches in our sections of the balloon, holding rope ties oppositeand heads lowered. There was a gentle bump and the basket settled. We were down. “You can sit up now,” Nihat instructed us and we stood as the crew rushed around with small blankets, throwing them over any prickly bushes that might snag the balloon as it deflated. The support vehicle arrived and we clambered out, about to be whisked away to a champagne breakfast. After the exhilaration of the flight, even that was going to be a bit flat. 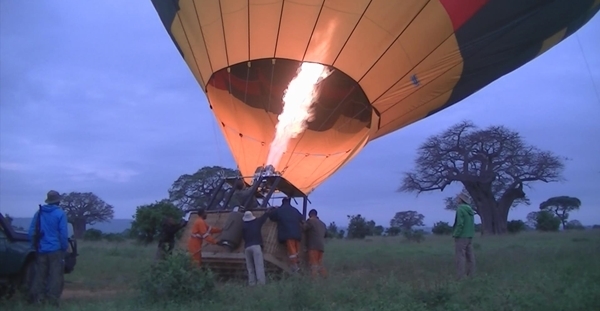 Robert stayed at Tarangire Balloon Camp, where the balloon safaris are based and operated by Adventures Aloft.